Now A days, Designers are more focusing on comfort and safety Feature in automobile vehicles. Even government has made compulsory some safety features like Antilock breaking System. This article will discuss about some major safety features that now a days used in automobile car and other vehicles. “Active safety” is used to refer to technology assisting in the prevention of a crash and “passive safety” to components of the vehicle (primarily airbags, seatbelts and the physical structure of the vehicle) that help to protect occupants during a crash. 1. Anti-lock braking system, Brake assist, or Emergency brake assist. Automatic braking is a technology for automobiles to sense an imminent collision with another vehicle, person or obstacle; or a danger such as a high brakes or by applying the brakes to slow the vehicle without any driver input. Sensors to detect other vehicles or obstacles can include radar, video, infrared, ultrasonic or other technologies. GPS sensors can detect fixed dangers such as approaching the stop signs through a location database. An automotive night vision system uses a thermographic camera to increase a driver’s perception and seeing distance in darkness or poor weather beyond the reach of the vehicle’s headlights. Night Vision Assistant was introduced in 2010 on the Audi A8. Emergency brake assist (EBA) or Brake Assist (BA or BAS) is a generic term for an automobile braking technology that increases braking pressure in an emergency situation. By interpreting the speed and force with which the brake pedal is pushed, the system detects if the driver is trying to execute an emergency stop, and if the brake pedal is not fully applied, the system overrides and fully applies the brakes until the Anti-lock Braking System (ABS) takes over to stop the wheels locking up. An airbag is a vehicle safety device. It is a type of occupant restraint system that consists of a flexible fabric bag, also known as an airbag cushion. The airbag module is designed to inflate rapidly then quickly deflate during a collision or impact with another object or a sudden deceleration. 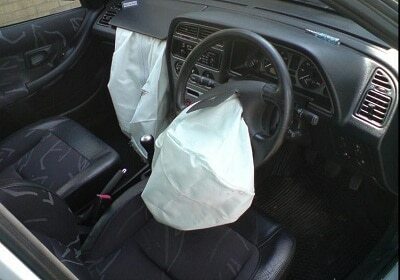 The purpose of the airbag is to provide occupant protection and restraint during a crash event. The airbag provides an energy absorbing surface between the vehicle’s occupant and a steering wheel, instrumental panel, A-B-C- structural body frame pillars, headliner and windshield/windscreen. Front fog lamps provide a wide, bar-shaped beam of light with a sharp cutoff at the top, and are generally aimed and mounted low. They may produce white or selective yellow light, and were designed for use at low speed to increase the illumination directed towards the road surface and verges in conditions of poor visibility due to rain, fog, dust or snow. Adjustable steering column allows steering wheel height to be adjusted with only a small, useful change in tilt. Most of these systems work with compression locks or electric motors. Adaptive cruise control ( or radar cruise control) is an optional cruise control system for road vehicles that automatically adjusts the vehicle speed to maintain a safe distance from vehicles ahead. It makes no use of satellite or roadside infrastructures nor of any cooperative support from other vehicles. Hence control is imposed based on sensor information from on-board sensors only. Direct TPMS, or Direct Tire Pressure Monitoring Systems (direct sensor TPMS) refers to the use of a pressure sensor directly mounted on the wheels or tires of a vehicle.The pressure inside the tire is measured using a pressure transducer with the pressure information being subsequently sent to the vehicle to warn the driver of under or over inflation of a tire. The pressure information is commonly transmitted to the vehicle using radio frequency (RF) technology, though systems using mechanical, electrical or magnetic methods have been used over recent years. A traction control system (TCS) is designed to prevent loss of traction of driven road wheels. TCS is activated when throttle input and engine torque are mismatched to road surface conditions. A collision avoidance system is an automobile safety system designed to reduce the severity of an accident. Also known as precrash system, forward collision warning system or collision mitigating system, it uses radar (all-weather) and sometimes laser and camera (both sensor types are ineffective during bad weather) to detect an imminent crash. Once the detection is done, these systems either provide a warning to the driver when there is an imminent collision or take action autonomously without any driver input (by braking or steering or both). Collision avoidance by braking is appropriate at low vehicle speeds (e.g. below 50 km/h), while collision avoidance by steering is appropriate at higher vehicle speeds. Cars with collision avoidance are also equipped with adaptive cruise control, and use the same sensors like ACC. Cornering Braking System is designed to distribute braking force during braking whilst cornering. It works by applying braking pressure asymmetrically despite physically difficult conditions (e.g. the car swerving towards the inside of the bend when the wheel load changes). By asymmetrically distributing brake pressure to the left- and right-side brakes or by reducing pressure (to the rear axle), even if the driver brakes outside the normal range of ABS. 14. Seatbelts limit the forward motion of an occupant, stretch to absorb energy, to lengthen the time of the occupant’s negative acceleration in a crash, reducing the loading on the occupants body. They prevent occupants being ejected from the vehicle and ensure that they are in the correct position for the operation of the airbags. Blind spot warning systems detect the distance and closing speed of objects in adjacent lanes and alert the driver if a collision is imminent. On a highway, a car which is far behind can be clearly seen in the rear view mirrors. However, as the car approaches, a point is reached where the car cannot be seen in either the interior or exterior mirrors. Typically this occurs when the car is just behind and to one side of the vehicle it is overtaking. It is a common mistake for drivers to change lanes when there is a vehicle in this so-called “blind spot”, a manoeuvre which causes many crashes. Several manufacturers have developed systems which monitor the blind spot and help a driver to change lanes safely. Some systems are camera-based, others rely on radar. You might also place an advertisement in the phone book, newspaper or neighborhood magazines offering an initial-time Review buyer discount to draw in new clients. If you can, use humor inside your ads, it's a great way to attract attention. Safety is very essential especially in automobiles. Therefore, automobile manufacturing companies are introducing different types of new features and specifications in vehicles, which is helpful for the driver during accidents. Especially in luxurious cars, we have found several kinds of high safety gadgets and features to improve the safety concerns of the rider. While driving a car we must be aware of its safety. Many people are loosing their lives due to car accident. First of all before driving we must check our tires and always drive in a normal way which is must be comfortable for us. We must obey traffic rules which is safety for u. I am having a Porsche car. I am having same car features as mentioned by the author. Airbags and seat belts are really necessary which may help us from accident.